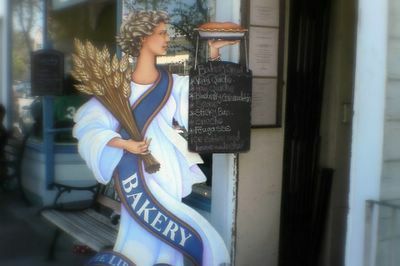 Friendly neighbourhood feel, Toasty Aromas, Superb Eggs Florentine, On-site Bakery. < Upsides No reservations. You may have to wait for a table. Some staff seem friendlier & more competent than others. Does Liberty Cafe serve the Best Eggs Florentine in San Francisco? On Saturday I stumbled across a little gem of a Cafe in somebody else's hood, situated on Cortland Avenue, at the heart of Bernal Heights in the outskirts of San Francisco. This a popular place as you can see from the crowds waiting for a table. If the truth was told, it was really too hot for an eggy brunch dish, but fate intervened when my friend, P and I decided we should should share the Eggs Florentine (like a Benedict but with spinach instead of bacon). Boy, are we glad we did. This was the best version of my favourite brunch dish I have had in a long, long time. Everything was perfectly balanced and cooked just right. The spinach still had some vibrancy, the sauce didn't overpower, the egg had just the desired amount of gloopy yolk, the muffin wasn't soggy at all. It was a rendition of a rich dish that seemed to taste much lighter than usual. I'd definitely go back to The Liberty Cafe just for these little beauties. Perfect! I am already dreaming of them. Next time, no sharing. 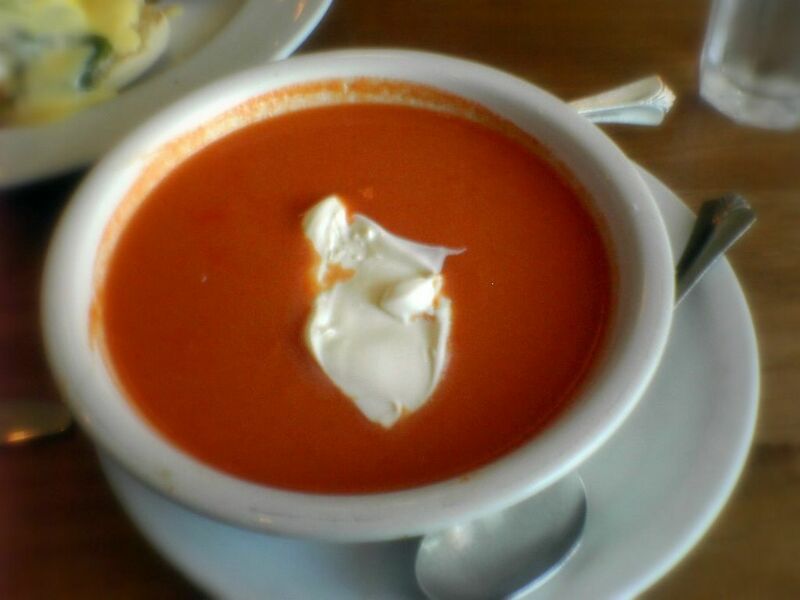 The soup, a puree of red pepper topped with creme fraiche, was served chilled which suited the weather, uncharacteristically hot for a San Francisco summer. It looked pretty and it was ok, if a little bitter. The creme fraiche, that might have mellowed it out, was too thick to blend with the soup. Just fine, but by no means spectacular. In the Cafe you can try a selection of their bread by ordering a basket of it with butter and a sharp but sweet strawberry jam. For $5 you could fill quite a few bellies. You are given a basket packed with six huge slices of toasted homemade bread. Challa, wholemeal, walnut, currant, raisin-orange and corn. 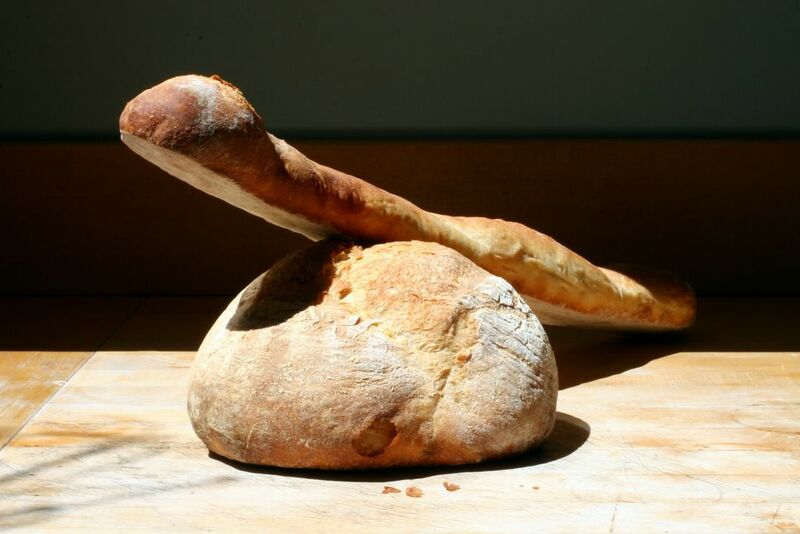 It's a great way of sampling the goodies before heading to the bakery at the back of the Cafe for a take-home loaf. Liberty Cafe - smells overwhelmingly of toast and makes great Eggs Florentine. I'll definitely be back! PS. 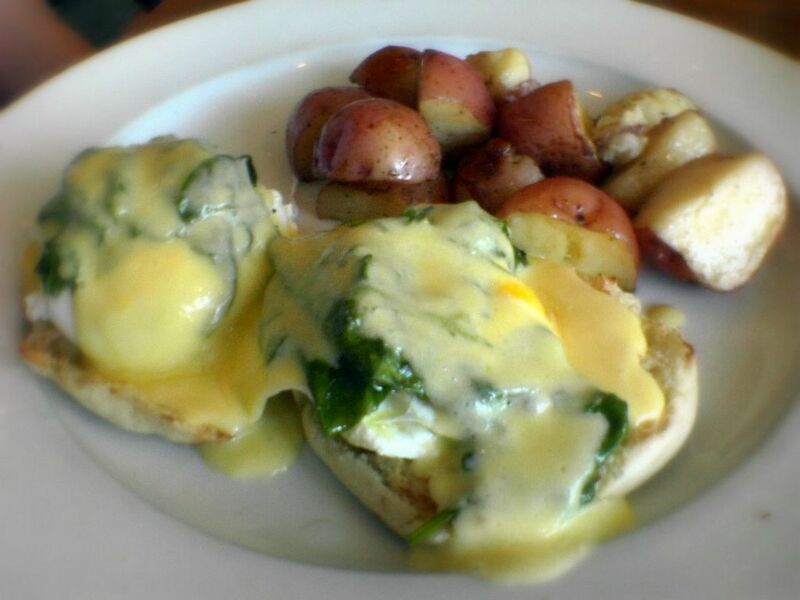 This review was First Impression If you think you know of another Bay Area brunch spot that you think can outdo Liberty's Eggs Florentine then please share with a comment. What lovely looking eggs florentine, another personal fave. After an utterly disappointing brunch out this Sunday (terrible hollandaise, items arriving not as described in the menu), I'm happy to see someone else had better luck! One of my favorite spots in the City. The pot pie is divine! As much as I love food in Taipei, there is NOTHING better than a western sunday brunch. Relaxed on a day off from the work week, you start off with a nice cup of fresh squeezed oj and then eggs (done whatever way), the sides of potatoes, which are just a touch soft (but still retain their firmness) with a little seasoning and some toast! Perfect meal. I *love* Liberty Cafe but haven't been for ages. Their blueberry pancakes are so delicious! liberty's famous for the chicken pot pie and the banana cream pie. I guess brunch too now. Did chez maman open a couple blocks down across the street? tara - there are dozens of so-so versions of eggs benedict et al in this town, which is why it was so good to have a decent one for a change. Jeanne - I have heard many whispers about the pot pie. Maybe I will try it for dinner one day. Rose - I am getting used to the American-style Sunday brunch, but really what i miss the most muself round here is a decent English Breakfast! Ced WIll need to try the banana cream pie - have you tried it? It is good. We did go for a walk after brunch but as I didn't see Chez Maman - I am assuming we walked in the other direction. I'd forgotten that was where it is opening. I was at the other one in Potrero on Saturday. My current addiction is their goat cheese salad. Simple but tasty. I simply cannot agree with your review. I think they serve the worst breakfast in the Mission/Bernal area. It's quite tiny and very expensive, with very bad service. Funny you found it crowded--I haven't seen it crowded on the weekend in a while. I'm so glad you mentioned the Thomas' English Muffins. They should be ashamed. Why not offer a couple of small homemade muffins with every breakfast? They have that stellar bakery kitchen right there. Oh, and I am constantly boggled by the ineptitude and paucity of offerings at the Liberty Bakery. I live in the neighborhood and check up on them at least twice a week. Terrible, weak coffee too. Indeed Kathy, English Muffins are easy to make, although I don't think I have ever come across a brunch place who uses home made ones. They are little labour intesnsive as they need to be pan fried. Let me know if you find anywhere! Liberty Cafe is my local go to restaurant and cafe. 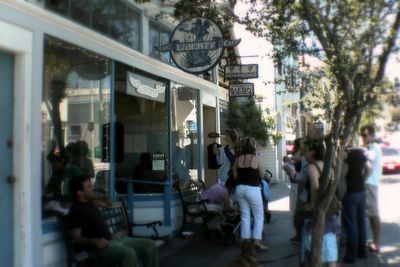 They offer an unending creativity with their brioches and pastries, that is the cafe does in the back of the shop. In the front restaurant for breakfast they have one of the best corned beef hash I have ever had, and yes the pot pie is crazy good too.